In 2004 I started writing a book that would become BOOK OF A THOUSAND DAYS. For some time I'd wanted to reimagine the Grimms Brothers fairy tale "Maid Maleen" but had every intention of creating a fantasy world like others I'd written before: inspired by a kind of old Northern Europe, like the lands of the fairy tales I adapted and that of my ancestors. I was afraid of cultural appropriation, careful not to march into someone else's culture and try to colonize it with my own stories. While I loved reading books that weren't all just white people, I felt that, as a white person, it wasn't my place to tell stories that took advantage of other cultures. I would stick to places and cultures to which I had a direct inheritance. But when I was working on BOOK OF A THOUSAND DAYS, my parents moved to Mongolia for two years. As I researched the land and the history, the story I'd begun and the Mongolian landscape and history slid together so perfectly, I couldn't bear not to let the story be what it wanted to be. I got over my fear, tried to come from an open place of love and respect, and wrote the story. The original cover was a photograph of a headless girl (as was all the rage in those years--Female Torsos 4EVAH) so you couldn't see from the jacket that the main character (and all the characters in the book) looked like Mongolians of our world. But the book is filled with illustrations. While this book never hit any best seller list, it did well and received some lovely recognition from awards, state lists, and reviews. When it went to paperback, my publisher gave it a new jacket. My publisher was great about this. They sought out a Mongolian-American model for the shoot and did a really lovely job, I thought. I've always been more of a fan of paintings than photograph covers, but I was happy with this one. Given the decent release the hardcover had had, everyone expected the paperback to make a big splash. It did pretty well, but nothing like the expectation. Looking over royalty statements years later, all of my paperbacks have outsold their hardcovers (usually doubled or more) except for this one. The only one with a person of color on the cover. When I did book signings where the store would have stacks of books on the table before me, I'd notice that the photograph covers with white girls would significantly dip down or disappear, but this beautiful book's stack remained tall. When people shopped by cover, they passed this one over. When I visited schools, school librarians who told me they had large Asian populations in their student body said they wanted the paperback specifically. They knew representation matters. That those students who were of Asian descent would be happy to see someone who looked somewhat like them on a cover, leading a story of her own. But with that assumption also came the other side. That schools with large white populations in their student body wouldn't be interested in the book. That stories about someone who looks Asian isn't for everyone (i.e. white people). It's niche. I was sorry for this. I feel that this book is my best work. I felt really honored that I got to tell Dashti's story. But at that time, I never considered that my experience was considerably different than it would have been if I'd been an Asian author. A Mongolian-inspired fantasy book written by a white woman is still much more likely to be accepted and read by white readers (who make up 75% of the US) than an Asian author writing the same. This should have been a logical conclusion for me. I certainly had first hand knowledge with how we tend to honor the stories of men over women. That men's stories are universal and women's stories are niche. A man can write an important work of art that involves relationships. The same book by a woman would be condescendingly called "chick lit" and recommended only to other women. This is a reality that I've seen over and over and over again. But I don't have first hand knowledge about the experiences of a person of color. While I was worried that it wasn't my place to write about another culture and I hesitated to offend or get it wrong in the writing, I didn't think about the after publication part. How as a white woman the path would be largely paved for me. I believe that white readers would have been more likely to purchase this book if instead of a Mongolian-American on the cover there had been a skinny white model in a ballgown. But those same white readers were more likely to purchase a book with a Mongolian-American model on the cover written by a white author than one written by an Asian author. The same way adults are more likely to give a boy a book about a girl if it was written by a man than if it was written by a woman. Books can and should be both mirrors and windows. Both are precious experiences. If we're only reading books written by those of our own experience, race, religion, gender, we're missing so much of the world. I hope we're getting over this often-unconscious biases. But in the meantime, allow me to recommend some wonderful books by Asian-American authors in a by-no-means comprehensive list. And please add your own recommendations. I'm sure I'm forgetting so many of my favorites and there are so many I don't know yet! Can white writers write non-white characters? This past week, a group started a campaign on twitter #WeNeedDiverseBooks that trended for days. Blogs, twitter, tumblr, instagram facebook were lit up with people sharing photos, stories, ideas about how diverse books are both wanted and needed. Diversity just means "reality," i.e. books (and movies, etc.) work best when they reflect the richness and variety of the real world rather than only representing one sliver of it. But diversity most often connotes race. And so lots of race questions rise up in this conversation, such as, is it okay for writers of one race to write from the point-of-view of a character from another race? Lisa Yee wrote her thoughts about this, which I appreciated. Here's my own experience. When I was drafting The Goose Girl, I originally was going to make Bayern an African-type continent, everyone there having a deep-brown-to-black skin, while Kildenree would be the European-type continent with pale skin. I was inspired by Le Guin's Earthsea books. But I quickly realized the story required Ani to hide in Bayern, so she couldn't look too different from the Bayern people. I could have chosen to make Ani dark skinned as well but I decided not to, out of misguided respect and fear. As a white person, I was hesitant to try to speak from the point-of-view of someone of another race, even in a fantasy setting. I felt like I only had access to the heritage of my own bloodlines. So I based Bayern on Germany, both because the tale was recorded by the brothers Grimm and because it is one of the lands of my ancestors. I'm not saying that was the wrong or the right choice (I don't believe there was necessarily a right or wrong here), but that this was my creative process. When I began a new series with Princess Academy, again I felt that I only had rights to the lands of my ancestors, so I chose to base the setting on Scandinavia. And the research and writing was a lovely experience for me. While I was drafting Book of a Thousand Days, I was also studying about Mongolia, because my parents were about to go live there for two years. And the more I learned, the more the research slid naturally into the story I was working on. Perfectly. As if that had been my intention all along. I had a moment of crisis. I wanted to base the setting on medieval Mongolia, but did I have the right to appropriate a land I had no blood or familial ties to for my story? Eventually I decided, yes. I am a human being. I can take inspiration from the stories of our shared planet. It was a little easier for me to make this jump since I wasn't writing a true historical setting but a fantasy kingdom inspired by a historical setting. Dangerous is my first young adult book not set long-ago-far-away but in our own world. I don't remember my exact thought process in deciding to make my main character biracial with a Paraguayan-American mother and white American father. There was reason to have a bilingual character and the choice seemed interesting for the story. The supporting cast also has a Russian-American, African-French, Korean-American, German-American, and African-American. These choices make sense in the story, but if this had been my first book, I don't know if I'd dared to make them. Again, out of misguided respect and fear, I might have been hesitant to try to embody the experience of a character who has a different race than me. I think that would have been a mistake. This story makes more sense, is richer, and is truer with the diverse cast. If I'd tried to write this story with an all-white cast, that would have been forced and untrue, because it wouldn't have reflected the actual world the story takes place in. Making creative choices from a place of fear (even fear mixed with loving and honest respect) is never a good idea. I appreciate writers who are respectful of other cultures and experiences. And I don't think that every book needs to have a diverse racial cast. A book set in a town where everyone is white can exist. Those stories matter too. But I always want to make sure I'm open to what the story needs. And all stories (ironically perhaps, but especially fantasy and science fiction stories) need to have a foundation of truth in order to work. And the truth of our world is colorful, rich, expansive. I think it's wise, as writers, that we're always checking ourselves, making sure we're not just defaulting to all white, straight, able-bodied, non-religious, etc., characters. Not defaulting to Neutral. But keeping our stories open for the possibilities of diversity. Hebrew. One of the most intriguing and metaphorical covers ever. What do you think? English-UK, hardcover and paperback. Preference? German. I am such a sucker for this cover. Spanish. Germany went for an Asian girl with flowers and Spain went for the howling wolf and Stephenie Meyer quote. I'd be curious to know which sold better. (I don't know if other authors ever hear how their books sell in other countries but I don't.) Both, I was interested to see, kept the same title. And same story, I can only assume. Japanese. This looks like the same cover artist that did Princess Academy too. I like their outfits. Interesting that one is blonde, no? Italian. Used the same cover as the UK. I'll be on VoiceAmerica radio program Thursday. You can see the website for details. The program's theme is Strong Women Characters and the other guests are Meg Cabot, Kristin Cashore, and Diane Gabaldon. Meg has a great post about it--love her. And I agree that the host, Matthew Peterson, was super great. For information about our July 19 Writing for Charity event, click here. Full Cast Audio has done it again. They produce the audio books for all my young adult books, and I've never been anything but button-bursting pleased. 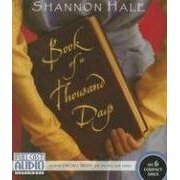 This time they tackled book of a thousand days. This one was unique because it's my only book in first person, and since Full Cast does age appropriate casting, that meant that the entire book would be narrated by a young voice. Who could be up to that challenge? Chelsea Mixon, of course. She took my breath away with her wonderful performance as Enna in enna burning, now her Dashti is equally brilliant. And yes, she is a teenager. What a talent. In addition, she had to sing Dashti's healing songs, which she did beautifully and lovingly. It's always an extraordinary gift to get to listen to the audio book of one of my own. It's like seeing it for the first time as a reader instead of the writer, really getting to experience the story for the first time. I loved it. What a relief to hear those words and not cringe with regrets. I worked very hard on this book and I'm still inordinately pleased with how it turned out. Listening to the audio book, I was reminded again about what a huge risk it was to do this story in the first place. I mean, start a book by locking up the main character in a windowless/doorless tower? Are you insane? And leaving her there for nearly half the book? That's a Creative Writing 101 no-no. I remember during those years when I was thinking about this story, outlining and taking notes, really questioning myself if I could do this. I knew it was a stupid idea. But the story haunted me so much I had to try. One of the trickiest parts of the rewrites was finding a balance, how much time to spend in the tower, how much of their daily lives to tell. I could have written hundreds of pages. I knew so much about Dashti and Saren, I was so interested in their lives. Finding how little to tell can be more challenging than writing volumes. It was a challenge, but ultimately this story was a joy to write and experience. And re-experience thanks to Full Cast Audio.